Grapefruit vegan cheesecake that is creamy, rich, and SO easy to put together! Made with cashews, yogurt, and baked to vegan cheesecake perfection. This post is sponsored by Zevia. Thank you for supporting the brands that makes this space possible! Ready for the BEST vegan cheesecake with all the goodness of a dairy cheesecake, but made with cashews and NO tofu? It’s HERE and it’s so amazing that I had to share it on National Cheesecake Day! I promise that this is so easy (the filling is whipped up in the blender) and you will fool even the most loyal regular cheesecake fans with this grapefruit vegan cashew cheesecake. Ok let’s talk about vegan cheesecake! I have a few other cheesecake recipes on the site (my personal favorite being this pumpkin version, SO GOOD) but this one is just the BEST version for summer. 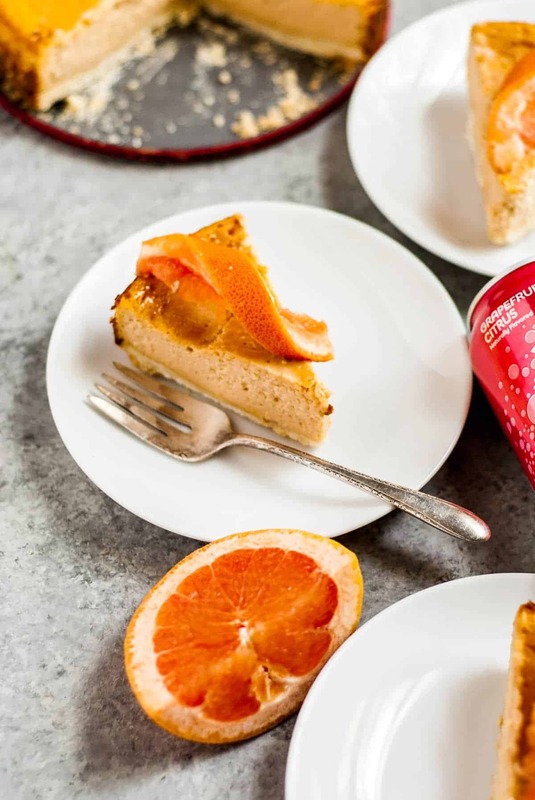 It’s filled with fresh grapefruit juice, grapefruit Zevia, and my ultra secret, really favorite ingredient that makes this vegan cheesecake SO good, vegan yogurt! I discovered the magic of making a vegan cashew cheesecake with vegan yogurt a few years ago when I was trying to find a vegan cheesecake recipe that still used the traditional methods of making cheesecake, but without the dairy. Traditionally, cheesecake is baked and then cooled, giving it that perfect, creamy texture that is great for pairing with just about anything AND it doesn’t have the weird texture of no-bake cheesecakes. Don’t get me wrong, there is a perfect time and place for no-bake versions, but as much as I am tampering with baked goods and making them vegan, I believe in the classics! I think a baked cheesecake just has a certain texture and taste to it that you just can’t get from a no-bake version! Basically, I want my vegan cheesecake to taste like cheesecake, not just another no-bake pie situation that happens to kind of, maybe taste like cheesecake. Lots of feelings about cheesecake here, can you tell? Another thing about this vegan cashew cheesecake is that it doesn’t use a bit of that weird vegan cream cheese you can sometimes find at the grocery store! Personally, I don’t like the idea of plopping that stuff into a perfectly good cheesecake, and I know that not everyone has access to vegan cream cheese. I don’t really love hunting down that one specialty ingredient myself, so I’m not going to make anyone else do it either. The base for this perfect cheesecake is just cashews, almond milk yogurt, a bit of sweetener, and whatever your flavor is! I’ve been craving all kinds of light, bright flavors, so grapefruit was a perfect pairing to an otherwise heavier dessert. A word about tofu in vegan cheesecakes! I love tofu in some desserts (obviously), but in cheesecake I found that it leaves a slightly overpowering taste. Since the base of the cheesecake really stands out, I think cashews and yogurt lend a better tang to the cheesecake over firm tofu. I also did a few experiments with tofu in cheesecake and found that it gave it a spongy texture vs. the creamy, very soft texture that you really want in a good cheesecake. It also bakes up very differently, so you will lose some of the super creamy texture if you are using tofu in a cheesecake recipe. Hope you LOVE this grapefruit vegan cheesecake as much as I do! I have a feeling that this won’t be the last cheesecake recipe around here, since it’s become a fast favorite! Preheat oven to 325ºF. Line the bottom of a 10- or 12-inch round springform pan with parchment paper, then grease lightly. Set aside. To make the crust: In a small bowl, stir together the flour, coconut oil, and powdered sugar until the dough comes together. Press into the bottom of the greased pan and bake for 7-9 minutes, until the edges are golden brown. You don’t want to over bake the crust, or it will become too hard after you add the filling. Set aside. To make the filling: Combine all of the filling ingredients in a high powered blender. Blend until smooth and creamy. Pour the filling into the prepared pan with crust. Bake for 1 hour, or until the filling does not jiggle with shaken. Chill for at least an hour before serving. Make sure your cashews have been soaked or you are using a high powered blender to make the filling! Otherwise, your filling will come out gritty and not smooth enough. Hi Abby, we don’t have zevia in Australia, what could I sue instead ? Hi Christine, Feel free to juice the juice of a grapefruit instead! Is the filling supposed to be liquid or more like thick batter ? It will be a thick batter!